T in the Park is just 6 weeks away, and with the countdown officially underway and excitement building, festival organisers DF Concerts and founding partner Tennent’s Lager have added more acts to the line-up. The Fancy Dress Friday theme has also been revealed, and in homage to the festival’s picturesque new setting Strathallan Castle, fans will be encouraged to dress up to the theme of the Ultimate Fairy Tale - think King or Queen, Knight or Jester, Dragon or Fairy. Singer-songwriter The Beach released debut single Thieves earlier this year, capturing the attention of BBC Radio 1’s Annie Mac (and her predecessor Zane Lowe), receiving airplay on the station. His gorgeous melodies meld epic crescendos and raw emotion. Widely hailed as one to watch, he is one of the most exciting singer-songwriter talents to emerge in recent years. Elle King is an American recording artist whose musical style encompasses country, soul, folk, rock, and blues. Born in Ohio and raised in Brooklyn, Elle retains her roots in a style that blends those worlds of both grit and mid-western charm. She’s toured with Of Monsters and Men, Ed Sheeran, and James Bay, and ties her old soul and rock 'n' roll influences into a sound that’s all her own. Belfast four-piece And So I Watch You From Afar also make their T in the Park debut this summer. The band released their fourth album Heirs earlier this month - a work of intense focus and adventurous abandon that reaches to the heart of artistic expression, packed with anthemic melodies and infectious hooks. After 20 stellar years with Feeder - including 8 gold and platinum albums and over 3 million album sales – frontman Grant Nicholas appears as a solo artist. His debut solo record Yorktown Heights evoked the carefree spirit of Laurel Canyon in the ‘70’s while also sounding bang up to date - ambitious, largely acoustic, and full of head-spinning melodies. Its follow-up – the six-track mini-album Black Clouds, was released last month. Welsh buzz band The Hearts have supported the likes of Paul Weller and Arcade Fire. 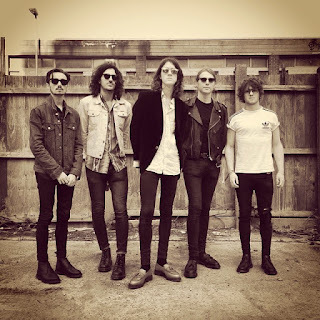 They released a 2 track EP Run Free at the start of the year, with lead track Lips receiving major airplay on Radio 1 and XFM, and are one to watch at this year’s T in the Park. Organisers have also revealed that the Slam Tent will be open on the Thursday night, with Animal Farm, Clouds and Ben Sims taking to the decks to get the party well and truly started. With some of the biggest names in music heading for Scotland this summer, T in the Park’s debut outing at Strathallan Castle is shaping up to be an unmissable weekend over 10th – 12th July. 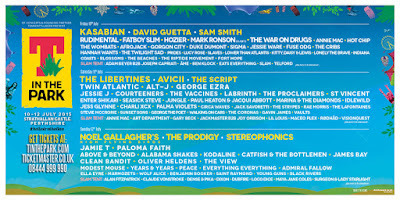 T in the Park 2015 tickets are on sale now at www.tinthepark.com or www.ticketmaster.co.uk or 08444 999 990. HYTE Ibiza releases its season calendar for a massive 18 week lineup at Ibiza’s Amnesia. Running from 3rd June until 30th September, HYTE has brought together a selection of artists that collectively represent a new movement in Ibiza clubbing culture. Loco Dice, Maceo Plex, Chris Liebing, Pan-Pot, DJ Harvey and DJ Tennis all join for dates throughout the season, as well as Berlin’s DeWalta, Amnesia favourites Mar-T and Cuartero, and Ibiza’s new hero, WHO. The lineup of guests runs deep; from legends such as Robert Hood as Floorplan and Kenny Dope, to big hitters from the underground such as Marcel Dettmann, Rødhåd and Anthony Parasole. Island vibes come courtesy of favourites such as tINI, Guti and Point G AKA DJ Gregory. DJ Koze, Mano Le Tough and John Talabot each bring their own eccentricity into the mix, with Matthew Dear, Bicep, Job Jobse, Monoloc and Harvard Bass all creating a spectrum of diversity from melodic pop grooves to heavy hitting bass. HYTE presents a musical vision that is crafted from the warehouses, clubs and beaches around the world. The original flavour of the island with the language and sounds of today. Anticipation is building for the 18th Annual Shambhala Music Festival to be held in Salmo River Ranch, August 7-10th, 2015. With an unparallelled line-up and a breathtaking venue, Shambhala’s ‘Are We There Yet’ video invites electronic music lovers to come Home to enjoy warm sunshine, cool waters, eclectic rhythms, and the unmistakeable magic of being surrounded by thousands of friends, new and old. Scenes of enchanted wilderness are interweaved with blissful dancing and glimpses of stunning, cutting-edge stage production, as well as music by festival performers, Camo & Krooked. Love the video? Check out Shambhala’s full 2014 Official Afterstory video and get amped up with Shambhala’s mix series featuring festival talent such as jackLNDN, jOBOT, and M!NT. The next mix will feature UK jack house and bass experts, Cause and Affect. A series of pre-parties will also take place across Canada with the ‘A Journey HOME’ tour, June 4-7, 2015 in Vancouver, Kelowna, Calgary and Nelson. Get more info on the website or on Facebook. Shambhala Music Festival is just around the corner and interested attendees are encouraged to purchase tickets soon as cut off dates for shipping are fast approaching (June 1 for the U.S. and July 1st for Canada) and tickets are expected to sell out quickly. Tickets sold after the shipping date cutoff will be available for pick up at will call. RSVP on Facebook and reconnect with your family from the farm! 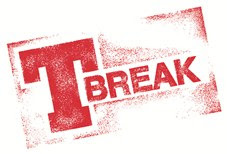 Tennent’s Lager put out their legendary T Break call for demos for the 20th time this March and Scotland’s unsigned acts responded, with over a thousand acts submitting their demos in the hope of landing one of 16 highly coveted slots on the T Break Stage at T in the Park. Tennent’s Lager have been proudly supporting Scotland’s grassroots music scene through T Break for 20 memorable years, providing the country’s freshest unsigned talent with the chance to showcase their material to fans, musicians and music industry insiders alike on the biggest platform for unsigned artists at T in the Park – the T Break Stage. Throughout T Break’s 20-year rock and roll history the T Break Stage has seen a huge wealth of talent coming through the ranks, with bands such as Biffy Clyro, Snow Patrol, Twin Atlantic and The View all playing the legendary stage. Each year the T Break line-up - curated by a judging panel of 15 of Scotland’s most respected and influential music industry experts - reflects exactly what’s going on in Scotland’s grassroots music scene at that time, and this year is no exception. "It was just the best feeling ever! We have always believed in ourselves so to get a reward like this, makes all our dedication worthwhile. Hearing that we got T Break just catapulted me back to T in the Park '99 - watching Blur play Tender - you envisage yourself on stage and now we can live that dream! We are over the moon!" 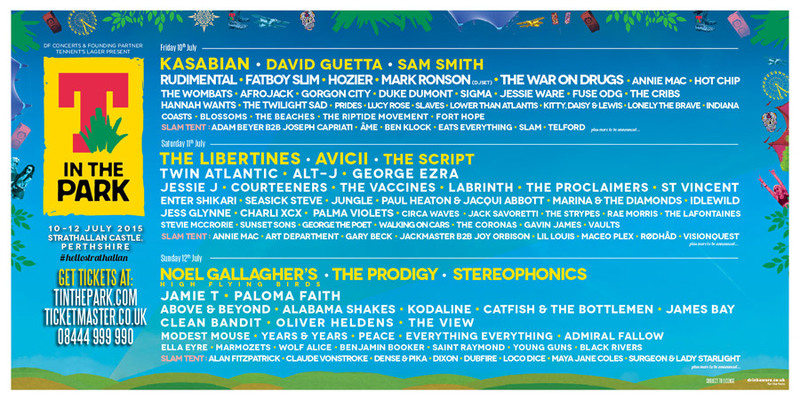 T in the Park 2015 takes places across the weekend from 10th – 12th July and tickets are on sale now, and available from www.tinthepark.com or www.ticketmaster.co.uk or 08444 999 990. Bookending the summer festival season, GMF is the perfect way to end an unforgettable summer of music in the sundrenched, picturesque surroundings of the Rock of Gibraltar. With Nashville rock heroes Kings Of Leon and pop icons Duran Duran already announced to bring huge headlining sets to Victoria Stadium this September, now even more names are announced for Gibraltar Music Festival 2015. Eccentric pop starlet Paloma Faith will be gracing the stage with her trademark brand of retro soul and jazz for a set that will no doubt be a standout of the festival. Undisputed legends of two-tone ska Madness will be on hand to provide a set sure to get the crowd on their feet. With an arsenal of hits from ‘Baggy Trousers’ to ‘House Of Fun’ at their disposal they are perfectly suited to the festival environment. Kaiser Chiefs are simply put one of the UK’s biggest and best line bands. With the livewire antics of frontman Ricky Wilson and a steady stream of chant-along anthems guaranteed expect nothing short of brilliance from the Leeds legends. Irish folk duo Hudson Taylor, exuberant dub funk band Dub Colossus, Kristian Vinales (DJ Set), Jeremy Perez and Tom Stott, Headwires and Guy Valarino have also been announced. Ahead of launching their new album superstar Spanish duo Estopa will be headlining the Radio Gibraltar Stage for their only show of the summer. Their set is not to be missed! GMF is a family-friendly, affordable and easily accessible music festival in the sunshine, rolling a holiday and some of the world’s biggest acts into one incredible weekend. 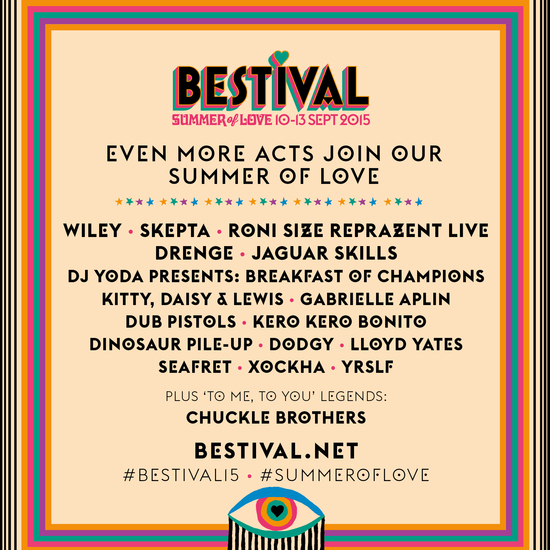 With over 25 stages, revolutionary soundsystems, zombie love-ins, psychedelic woodland adventures, 24-hour free haircuts, and a host of dazzling new attractions, Bestival’s Summer of Love is already looking pretty damn fit. But as ever, we want to get everyone we love involved, including this rather sultry bunch of musical marvels that will have you rockin’ Robin Hill all weekend long this September 10-13. 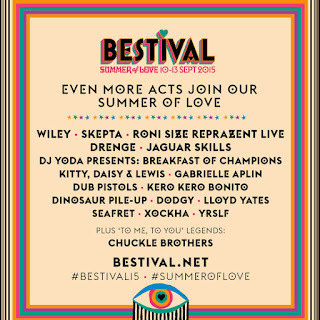 Bringing on the love with big fat beats, we’ll have main stage appearances from grime pioneer Wiley, who completely smashed it as our secret guest in 2012, plus the unstoppable skank machine, Dub Pistols. Not quite true, Barry, there are two Bestivals, but we know what you mean! Big love to all our Canadian brethren! More Isle of Wight-based Bestival main stage action will come from cool chanteuse Gabrielle Aplin, sing-along faves Dodgy, and the Isle of Wight’s own Xockha and Yrslf. Old blue, Bestival’s beloved Big Top will be playing host to some mighty sounds this summer, too, including the much requested return of Joseph Junior Adenuga AKA Skepta and an absolute must-see live set from drum n bass hero Roni Size and Reprazent. We’ll also have recently expanded noiseniks Drenge, our favourite scratch master DJ Yoda Presents: Breakfast of Champions, with his brand new hip-hop band busting up the Big Top live, and then the man himself will be taking on Bollywood for a typically special DJ set, and we’ll have one of the coolest bands ever to grace a festival, Sunday Best favourites, the utterly incomparable Kitty Daisy and Lewis. The Big Top will also welcome a high-voltage rock assault from Dinosaur Pile-Up, plus sets from Kero Kero Bonito, Lloyd Yates, Seafret and - we’re not sure it’s possible to express quite how excited we are about this - The Chuckle Brothers! Yes, it’ll be history in the making with be-mulleted slapstick to me, to you. CAN. NOT. WAIT. As if all that wasn’t enough to get you all giddy with joy, he was one of the smash hits acts that started our summer in finest style at Common People, so we’re extremely pleased that turntable ninja, Jaguar Skills, will be joining us to destroy the dancefloor at The Port. Blossoms will embark on a 13-date UK headline tour this autumn. The tour will open at Glasgow’s King Tuts Wah Wah Hut on 2nd October and includes a show at London’s Village Underground on 15th October. The tour will close on 23rd October in Manchester at The Ritz. Since releasing their debut single ‘Blow’ at the end of 2014, Blossoms have gone from strength to strength - selling out London’s Barfly and adding a third Manchester date due to popular demand and playing the BBC Introducing and PRS for Music Stage at SXSW. The band even reached No.7 in the UK’s first ever Vinyl Chart. In June 2012 Stillhet Music was born out of the desire of its founders Ian Weller and Liam Adlen to put on events that were set up, promoted and operated with the artist at their very heart. Their idea was to run Stillhet as a musical co-operative with the acts that performed for them, to give them a quality stage to showcase their talents free from the pre-gig burdens of pay to play, with the simple deal that at end of the night every single penny taken goes only to the performers. Stillhet Music continues to be real success on Liverpool's burgeoning music scene welcoming hundreds of music lovers month after month always looking for the next artist and new sound that will set their stage alight. The final word from Ian Weller ''you've got to remember Stillhet operates as a musical co-operative and we couldn't have reached 3 years without the commitment of all the artists we've worked with and the amazing support of our home venue Studio2 who share our passion for new music'. 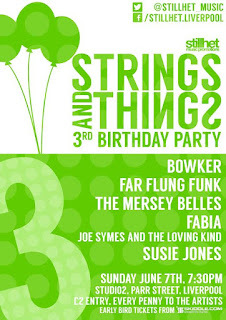 Event: Strings and Things 3rd Birthday Party!